Carl Bozenski's Christmas Village in Torrington, Connecticut, has been a holiday season tradition since 1947. Located on Church Street in Litchfield County's largest city, this free holiday attraction enchants visitors young and old. If you've never visited, there's one thing you need to know up front: The wait will be long to enter Christmas Village, but it will be worth it. Not only is Christmas Village open and free to the public, but once you're finally inside, each child gets an intimate reception with Santa Claus—and a free toy! It might be a little stuffed animal or a fire fighter action figure set. It doesn't seem to matter. By the time kids land on Santa's lap, they are thoroughly convinced they are inside his North Pole personal residence. 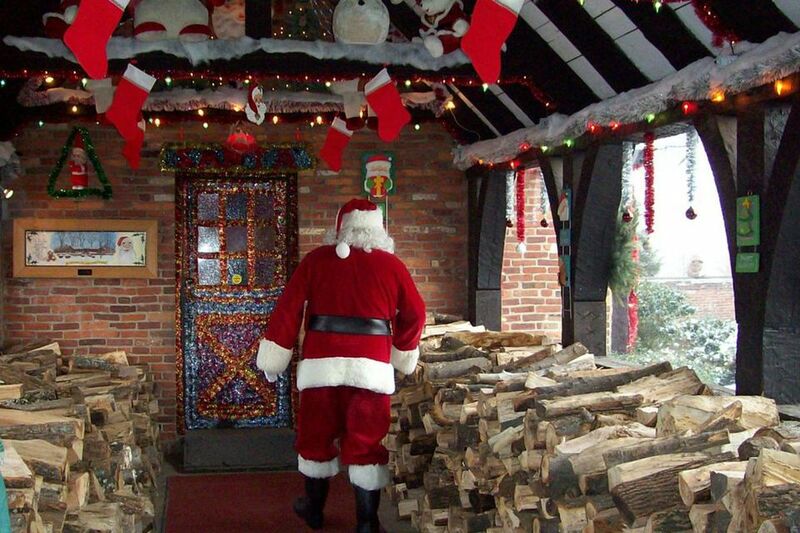 Christmas Village is also one of New England's best places to see Mrs. Claus. Christmas Village is open from the second Sunday in December (December 9 in 2018) through Christmas Eve. Hours are 1 p.m. to 8:30 p.m. daily, with shorter hours from 9 a.m. until noon on Christmas Eve (December 24). The event kicks off on December 9 at 12:30 p.m. with a parade that proceeds from the Armory, along Main Street, and up Mason Street to Christmas Village. From outside Christmas Village, it is difficult to tell just what awaits inside. You and your little ones will have plenty of time to speculate, as the lines for Christmas Village are always very long (an hour-and-a-half wait is typical on a weekday). You may encounter smart families who have sent Dad to wait in line an hour ahead. Be prepared and pack gloves and hats if the weather is chilly. You may need them even if it is sunny and relatively mild outside. You might also want to bring some fun "standing-in-a-line" games to keep the kids occupied. It's a good idea to have more than one adult with your group, so one of you can stay in line with the kids while the other makes a run for hot cocoa. The line to get inside Christmas Village moves slowly because only eight to 10 people at a time are allowed inside. Then, there is an additional wait for the tinsel-decked door to open to reveal... Santa Claus's house! This fabulously decorated room makes little children's eyes grow big, even before they spot the man in the red suit. Allow about a half-hour to tour the village after you've met Santa, so expect this outing to be at least two to three hours. Pro Tip: if you don't need to see Santa, you don't have to wait in that slow-moving line out front. Simply enter Christmas Village via the side gate, and you can see all of the other free attractions. From twinkling trees and carolers to a nativity scene, there are plenty of holiday displays to see during your visit to Torrington's Christmas Village. After your time with Santa Claus, follow signs to the next stop, where you'll meet the woman behind the guy in the red suit. Mrs. Claus always seems awfully relaxed and cheerful considering Christmas is approaching fast. The Toy Shop is the next stop. The outside of this cozy-looking log cabin doesn't reveal the vibrant activity going on inside. The elves laboring here seem very intent on meeting the day's toy quota. Little children are mesmerized as they watch these bearded toymakers at work. Next, don't miss your chance to meet the reindeer—including Rudolph—on display at Christmas Village. Parents, you will need to be prepared to explain why Rudolph does not have a red nose. If it's daytime, you can say it only glows at night, but if you visit at night, you'll have to get more creative! Kids also love climbing up and sitting in Santa's sleigh. There are many terrific Christmas card photo ops at Connecticut's Christmas Village, so be sure to bring your camera. Christmas Village is a long-standing tradition in Torrington, Connecticut. The annual event began in 1947​ when Torrington's Parks and Recreation Supervisor Carl Bozenski invited Santa Claus to visit Alvord Playground. The annual Toy Shower at Christmas Village is an important component of the event (December 7 from 5 to 8 p.m. in 2018). Mrs. Claus and the elves are on-hand as local businesses and residents pledge their support at this fundraiser. School groups and other local musicians perform, and light refreshments are served. It's a festive kickoff for this cherished community tradition, which generously provides a free toy for each child. WZBG broadcasts the Toy Shower live, and if you can't be there, you can still help make the magic happen by calling in your pledge to the station at 860-567-3697. Torrington is located 45 minutes west of Hartford, CT, and an hour and 20 minutes east of Poughkeepsie, NY. You will find Christmas Village at 150 Church Street. Be mindful to obey posted on-street parking signs. For more information, call the Torrington Parks and Recreation Office at 860-489- 2274.